Usually when we have long documents it becomes really hard to manage it, especially when we are working with a small part of it. Now with Word 13, we are able to Collapse and Expand a document in order to just view the parts that we need. In order to do this we must follow the steps described below. First of all we must check out that we are in Print Layout view. In order to do that we must select the View tab and from the area of the ribbon named Views we must select the command Print Layout as shown in the image below. Πρώτα θα πρέπει να έχουμε ολοκληρώσει την επεξεργασία του εγγράφου και αφού είμαστε έτοιμοι θα πρέπει να επιλέξουμε το tab Αρχείο (File) για να περάσουμε σε προβολή backstage και τότε από το πτυσσόμενο μενού να επιλέξουμε την κατηγορία Κοινή Χρήση (Share) όπως εμφανίζεται και στην παρακάτω εικόνα. We have a document created in Word and we want to share it with our colleagues or our bosses that are located all over the world!!! What do we do? Word 2013 is the answer. 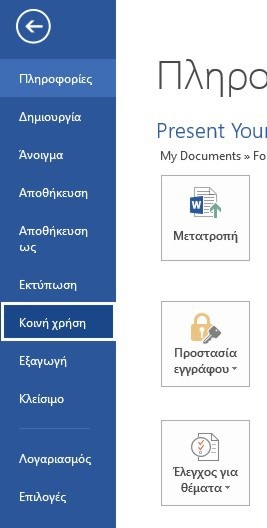 We can share our document with everyone whenever and wherever, with the condition that we have an internet connection. The procedure is very simple and described below. First of all we must select the File tab in order to move to backstage view and then from the bottom of the drop down menu to select the Share category as shown in the image below.